What are the common mistypes for god? 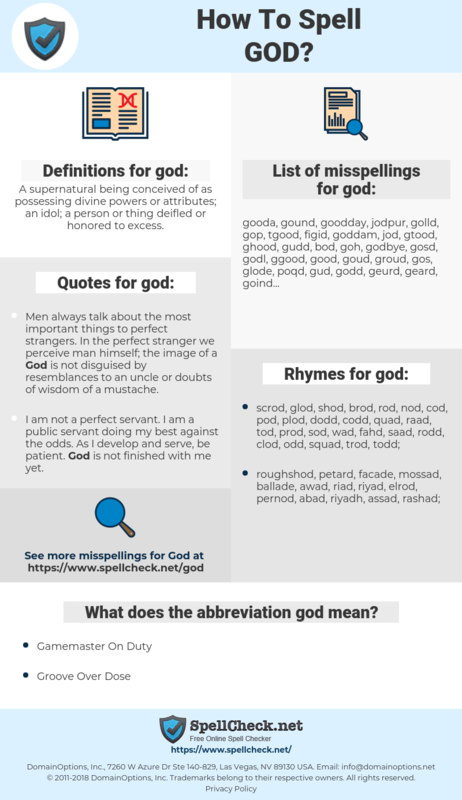 What does the abbreviation god mean? What are the usage examples for god? What are the quotes for god? What are the rhymes for god? What are the translations for god? 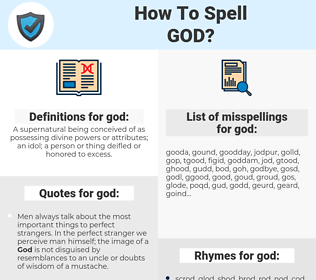 What are the common typos for god? A supernatural being conceived of as possessing divine powers or attributes; an idol; a person or thing deifled or honored to excess. This graph shows how "god" have occurred between 1800 and 2008 in a corpus of English books. 基督, 神人, 上天, 老天, 造物主, 老天爷, 佛爷, 青天大老爷, 天神, 天王. 神, 神様, ゴッド, しんめい, てんとうさま, 神明, むち, カムイ, 大御神, おおみかみ, 大神, おおがみ, 天道様, ネ申, だいじん, おおかみ, 天帝, じょうてん, 上天, てんしゅ, 天主, 上帝, てんてい.